I love single layer cakes. They have a rustic appeal that I find immensely comforting. Most single layer cakes are charmingly homemade in appearance, requiring no special skills to decorate them. No torting layers, no stacking, no praying you avoid the dreaded buttercream belly around the side of the cake. If you decorate cakes you know about buttercream bellies. No, a single layer cake is reassuringly easy to make, and during the whirl-wind of the holidays I can think of nothing I like better than something easy to make that also tastes great. 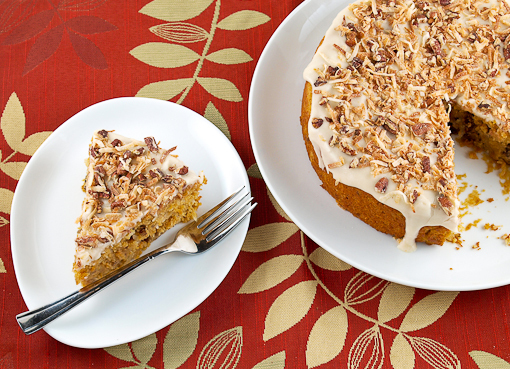 The center of the cake is so moist that it is almost creamy. This ridiculous amount of moistness is due to the sweet potato puree and the oil. 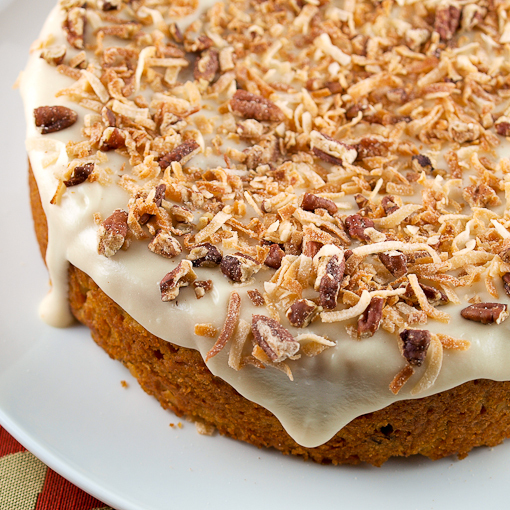 Cakes made with oil tend to be a little moister than those made with butter after they cool, and the sweet potato ensures that the cake stays moist after baking by making the crumb of the cake slightly dense. 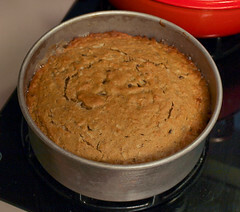 Not to say this cake is heavy, the flavor and texture are absolutely devourable. 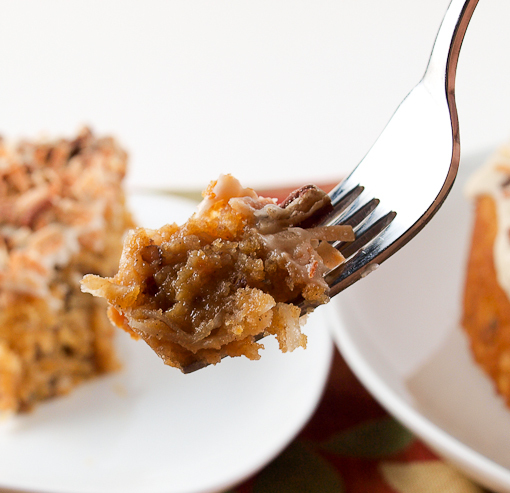 On the top, rather than a buttercream or cream cheese frosting, I made a bourbon laced glaze which I topped off with some toasted coconut and pecan. Aside from giving those who eat it a clue to what lies within, it adds a little bit of crunchy texture. 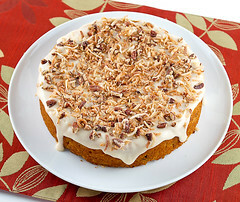 Make this cake for your Thanksgiving guests and no one will even miss the pie! 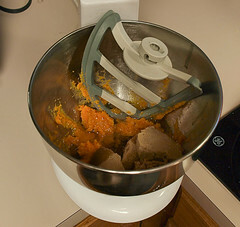 In the bowl of a stand mixer fitted with the paddle attachment, or in a large bowl with a hand mixer, cream together the brown sugar, oil, and sweet potato puree until smooth and well blended. Add the egg and vanilla and beat until completely incorporated. In a medium bowl whisk together the flour, cinnamon, allspice, baking powder, baking soda, and salt. Alternately add the flour mixture and buttermilk into the sweet potato mixture in three additions, beginning and ending with the flour. Fold in the coconut and pecans. 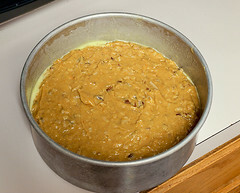 Pour the batter into the prepared pan and bake for 30 to 35 minutes, or until the cake springs back when gently pressed in the center and the sides of the cake are starting to pull away from the sides of the pan. Cool in the pan for 10 minutes before turning out onto a wire rack to cool completely. While the cake cools prepare the glaze. 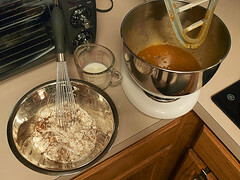 In a medium bowl whisk together the melted butter, powdered sugar, bourbon, vanilla, and two tablespoons of the cream. Add additional cream, a tablespoon at a time, until the glaze is thin enough to pour, but not too runny. Once the cake is cooled spread the glaze over the top, allowing some to drip down the sides. 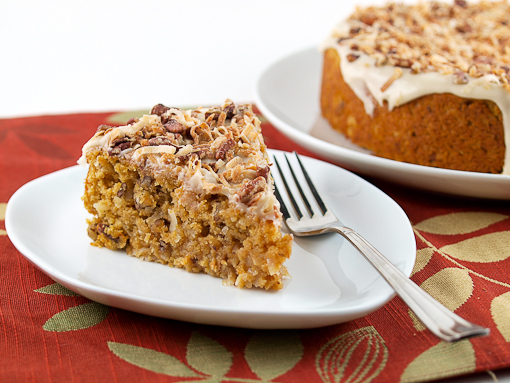 While still wet sprinkle over the toasted coconut and toasted pecans. Allow the glaze to set for one hour before serving.